Ki is a black 2005 Missouri Foxtrotter mare who came to MHARF in a 2013 humane case. She is a very nice mare who successfully completed our 2014 Trainers’ Challenge. She has had plenty of ground work, is broke to ride, and has trail experience. 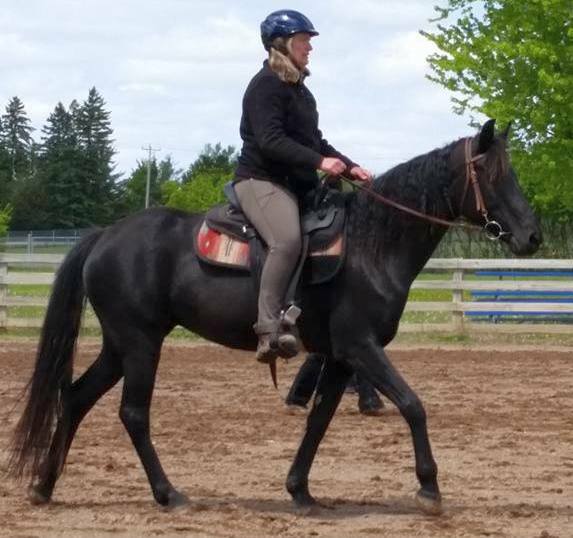 Ki is a gaited mare and is very energetic. She loves to move off down the trail. Suited to an advanced rider, an experienced youth or smaller adult. She has a slim build and is a high energy horse so does need supplemental grain. Ki is currently competing in the Truhaven 60 Day Rescued Horse Trail Challenge. She is available for adoption but will need to stay with her trainer until after the competition at the end of June. Follow Ki’s progress with trainer Carol Kirchoff here!